KDE is going places. With the release of KDE 4.4 beta, KDE team has clearly demonstrated what they really meant by a complete desktop overhaul. Already the second beta release of KDE 4.4, codenamed Claus, is released and is available for installation in Ubuntu. Update: KDE 4.4 RC2 released. You can install KDE 4.4 RC2 in Ubuntu by following the steps mentioned below. You need to add the Kubuntu PPA first. Goto Terminal and copy-paste the following line. Now if you have an already installed version of KDE, simply do the following. Those users who don't have an installed version of KDE in Ubuntu, Do each of the following step one by one. Done. 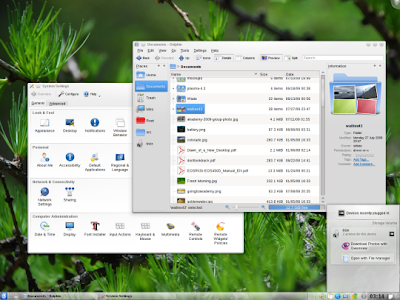 Enjoy the all new KDE experience. Get in touch with KDE 4.4, Watch this preview video.